Summary: The "Pittsburgh Parking Chair" becomes an iconic seat in our fair city through artistic interpretation. 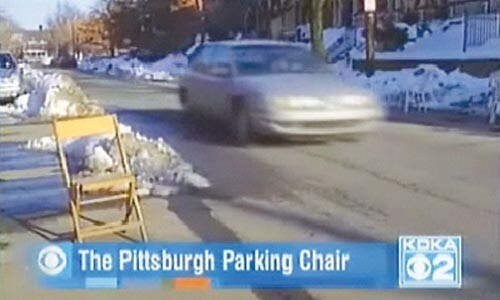 Reporter: Stephanie Watson, KDKA Channel 2 Airtime: 1 minute, 48 seconds on Feb. 20 Visuals: * Assorted styles of parking chairs along the curbs of Pittsburgh, including one of my favorites: the folding wooden church-hall-bingo chair. Highlights: * When Watson announces, "It's a Pittsburgh tradition as old as cheering for the Steelers and scarfing down a sandwich from Primanti Brothers. We're talking about the 'parking chair.' Unlike daffodils and tulips, which spring up in May, these start appearing right after snowfall. Two weeks after Pittsburgh was blanketed in almost two feet of snow, the ice is thawing, but the chairs remain." * When Watson transitions, "[T]oday, the Children's Museum hosted a tribute to the coveted parking chair in the form of art." * She commands, "Respect the chair: able to save a parking space from obtrusive neighbors, even the monstrous snow plow." * When the museum's Angela Seals remarks with a friendly grin, "Everyone has stories from the past two weeks about parking chairs. ... [I]t's a way of playing with something that we've all been dealing with over the past few weeks." * When Watson explains, "At the Children's Museum, a tribute, and part of the celebration of everything Pittsburgh called 'Pittsburgh Yinz Play!,' as nine local artists gathered to put their creative spin on Pittsburgh's infamous parking chair, like you've never seen before." * When artist Don Orkoskey explains, "[W]e created a parking chair that's sorta part dog and part chair and it's like a 'beware of parking chair' sorta situation. So it really is sort of a Pittsburgh thing, and it's unique to see it go to another level." * Watson continues, "Some artists are channeling their own frustrating experiences with their beloved parking chair into their creative process. * When Watson informs us, "Once the artists put the finishing touches on their masterpiece, the chairs were auctioned off and taken home to the highest bidder." 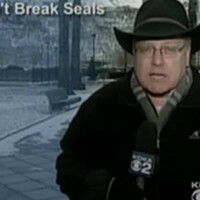 * When Seals adds, "You'll never lose your parking chair when it looks like a three-foot throne." * When Watson ends, "The money raised from auctioning off the chairs will go to support the North Side Charm Bracelet Project." What We Learned: Good chairs make good neighbors. Unanswered Question: Was there a Mayor Luke Ravenstahl parking chair? News Value: 5. The "Pittsburgh Parking Chair" story has been making the rounds, but this is a nice feature that showcases how Pittsburghers make things their own, and embrace the good and bad of their culture, for the benefit of others. It's the feel-good story of the winter!